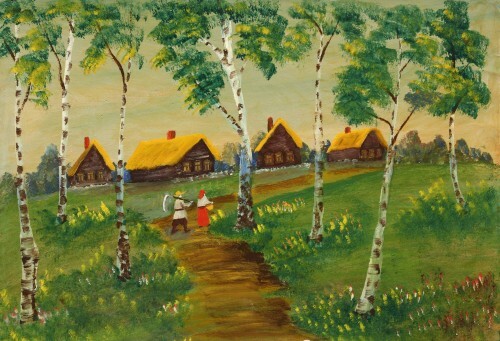 Vasiliy Grigoriev (ГРИГОРЬЕВ Василий Васильевич Grigoryev, 1914–1994). He was born in Kirzhach Vladimir region. From childhood he loved to draw, copied from postcards. 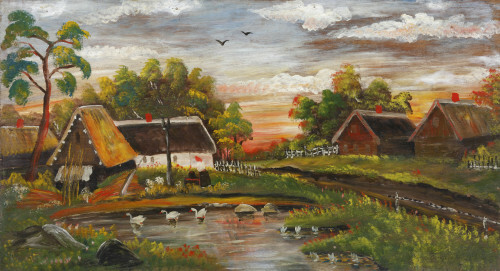 He lived in Moscow, and earned money by selling his pictures on Sukharevka – the famous Moscow flee market. 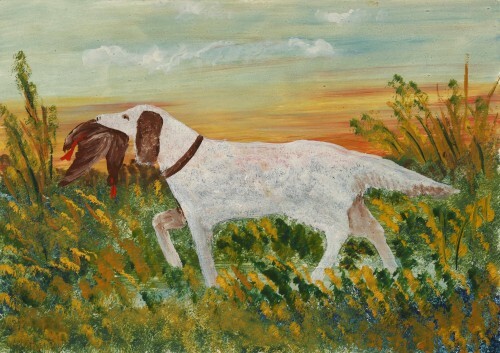 He later worked as an engineer in the steel industry, after his retirement in the 1980s he again turned to painting. 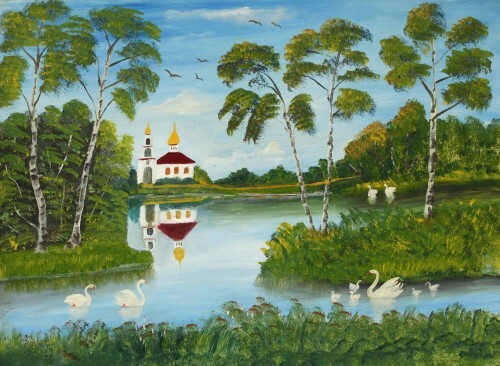 In 1988-89 he began to sell his paintings to an emerging market street in Moscow on Arbat. It attracted the attention of collectors. Later he worked on the orders of collectors. The first solo exhibition was Moscow, 1994. He lived and died in the town of Pushkino, Moscow region. 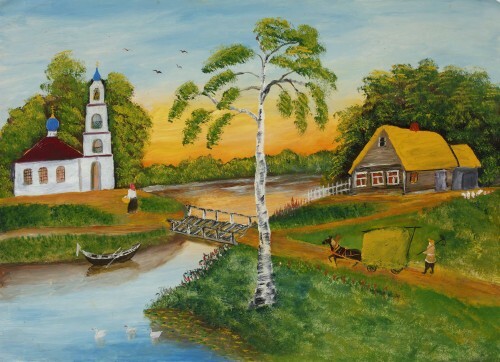 Creativity of Grigoriev is unique in Russian folk art example of transforming popular pictures (in traditional terms “kovrik”-rug) in the original works of naive art. 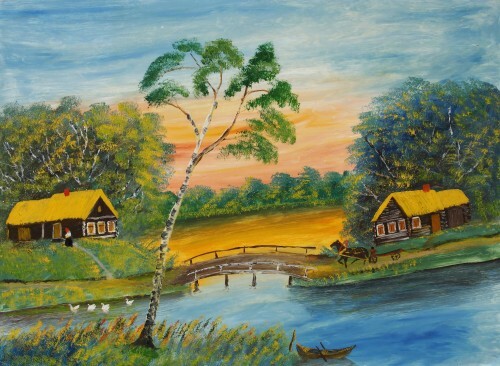 The favorite subjects Grigorieva are “Fair in Kirzhach”, “Night,” “Landscape with a pond”. They were repeated in dozens of variants. 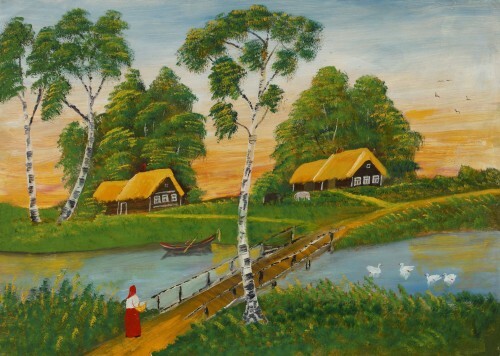 They are all in their own way interpret the motives that were preseant in folk ‘rugs’ a pond with swans, a mermaid, a house under the moonlit sky in a snowy forest, hunters draws sketches and so forth. But Grigoriev never repeated mechanically their work, each has a different of parts. He began to write on the oilcloth and plywood – traditional folk material for pictures, then went to work on paper and canvas. 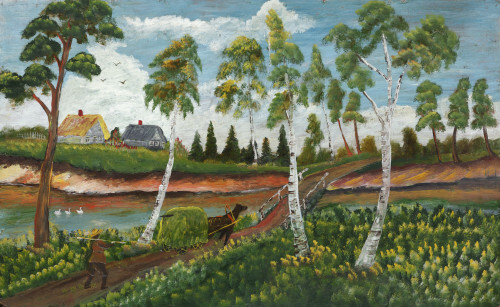 Pictures Grigoriev are a celebration of color. 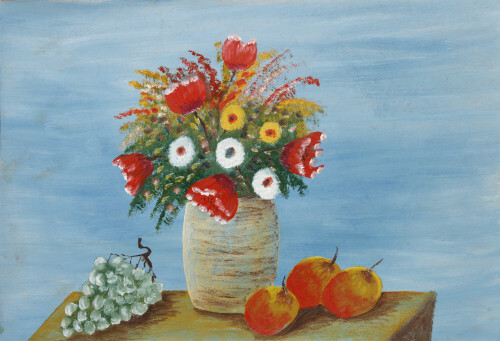 In the second half of the 1980s and early 1990s when his paintings have started to appear in exhibitions in Moscow, Grigoriev, when prompted by fans of his art, came up with new stories, “Dragon”, “Christmas tree”, “Easter still life”, “Still Life with Parrot” (in his tiny apartment really lived a parrot). And I saw … 2001. 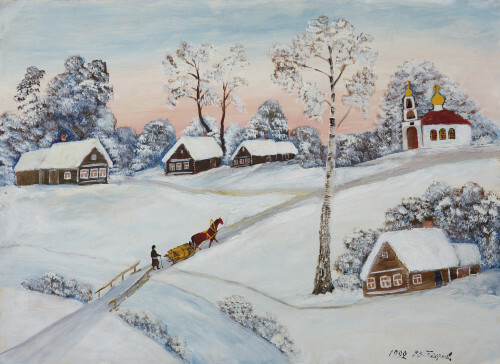 Soviet naive art. Introductory article by K. Bohemskaia. Moscow: Publishing Program INTERROS 2008.